You will agree with the common opinion that 2018 can be regarded as the year of deadlines. While it was the European Union that announced the GDPR compliance deadline of May 25th, it is now the turn of Google to come up with a website security regulation. Google proclaimed the deadline of July 2018, making it mandatory for all the websites to upgrade from the HTTP protocol to a more secure HTTPS grade. All in an attempt to encourage the best practices concerning stronger web security, this mandate released by Google can be looked upon as a welcome move. This article sheds light on the significance of the HTTPS deadline and how it is bound to impact the security and performance of your websites. For a layman, HTTP might not be very different from HTTPS. It could just be a matter of an additional letter “S”. But for all those who are in the online business will vouch for the significance of S in the HTTPS protocol. While both HTTP and HTTPS are website protocols involving the transmission of data that takes place between electronic devices, the addition of S brings the security element into picture. The expansion of HTTP is Hypertext Transfer Protocol and HTTPS stands for Hypertext Transfer Protocol Secure. When your website is aligned to the HTTPS protocol, it is enveloped in a strong security blanket through data encryption. That means, any bit of information that is sent or received by your HTTPS website is encrypted. Encryption is a security procedure that does not allow users to access and read the information that is being transmitted during a browsing session. On the other hand, all the data that is transmitted via a HTTP website is insecure and can land in the hands of fraudsters eyeing on saved personal information including login details, bank credentials and debit/credit card information. When your website is upgraded to HTTPS, you will be securing all the online information that belongs to the users of your website; at all times. It is an important piece of statistical information to note that Google Chrome has a major stake of over 58% of the global usage of internet browsers. Safari comes next in line with a mere 14% market share. With Google Chrome gaining the status of a market leader in the internet browser usage niche, website owners are left with no other option but to pay heed to Google’s mandate. The end of July 2018 can be earmarked as a prominent landmark in the direction of making website security a non-negotiable element to conduct any sort of online data exchanges. 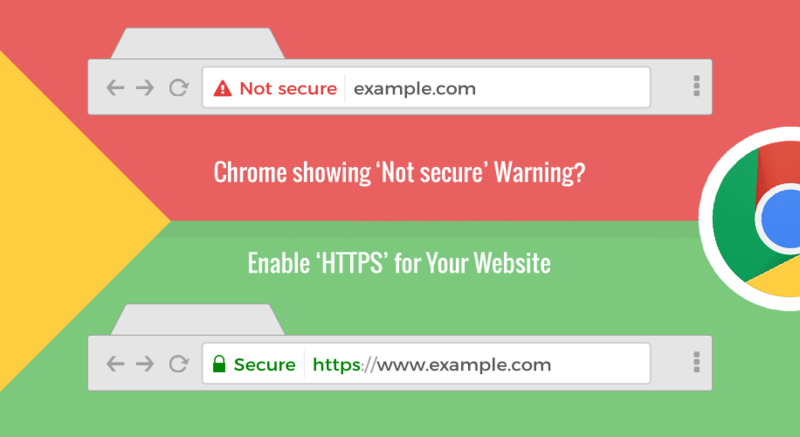 With the launch of Chrome 68, Google is already in the news doing all that it can to ensure all the websites are secured with the HTTPS protocol. To achieve this basic security objective, Google will come up with a categorical warning to visitors about any insecure site. That means, all the HTTP websites, post July 2018, will show up a red flag to visitors that those websites are not secure for any sort of data transfer. To sum it all, compromising on this July 2018 deadline will make all the HTTP websites susceptible to a considerable negative impact, affecting their performance. Website users are now the well-informed lot. They are constantly getting educated about the significance of securing and protecting online data that is stored in various e-commerce and banking interfaces. Consumer awareness is at an all-time high prompting them to always stay safe than to take any sort of risk. All in an attempt to protect website information, it is the need of the hour to go beyond the GDPR compliance and sign up for the HTTPS protocol. In order to secure your website with a HTTPS protocol, you need to obtain an SSL certificate from a reliable SSL certificate provider. Alternatively, you may also buy Cheap SSL from SSL2BUY. While all these activities look cumbersome, a conviction that this July 2018 deadline can do a lot of good to the performance of your website should take things forward. Along with greater customer attention that you begin to enjoy, your HTTPS website can confer many benefits that you can imagine. The following section of the article sheds light on all the negatives that your HTTP website has to deal with, if it is not tagged with HTTPS by July 2018. As an addition to the GDPR compliance statute, the July 2018 deadline announced by Google to secure online data is indeed a welcome move. However, if websites compromise on this deadline, Google will step in to take corrective action. It will begin to flag all the HTTP websites with a “NOT SECURE” tag. And when this happens, all the brand loyalists of the HTTP websites will no longer consider these websites as safe interfaces to transmit data. The declaration that your website is not secure to conduct online transactions will create a fear psychosis amongst first-time and existing users, leading to a drop in conversions. Online businesses thrive on the strength of consumer trust. It is because of the trust your visitors have on your website that they will share their personal information. It will not be an overstatement to quote that once trust is lost, everything is lost. If one fails to meet the July 2018 deadline of Google, all the HTTP websites will register increased website bounce rates. Non-compliant e-commerce sites will bear the brunt in the form of reduced conversions caused by the loss of confidence on the website to safeguard personal and financial information. Not acting upon the July 2018 deadline is sure to impact your website rank that is conferred by Google. All the HTTP sites post July 2018 will witness a significant drop in their organic search rankings, a negative spiraling effect that will cost these websites a great deal. After enlisting all the negative impacts of not meeting the July 2018 deadline, it is indeed essential to speak at length about the positives that HTTPS websites will reap. Once you comply with the deadline mandated by Google, your visitors will enjoy a great deal of confidence on your HTTPS website. When no red flags are raised on HTTPS websites, customers old and new will feel more secure to part with personal information. In addition to improving the trustworthiness of your website, you will also attract a new pool of consumers coming from a strong security cover that your HTTPS website offers. Another advantage of meeting the deadline of Google comes in the form of taking pride in adhering to standards of web security. You can lead by example that you are adhering to the standards of website security by safeguarding the personal information of your visitors at all times. This pride will eventually translate into better conversions when first-time and existing visitors will recognize your website as a safe interface to initiate any sort of data exchange. This way, you will be in a strong position to build strong customer relationships with your brand loyalists. By complying with the July 2018 deadline announced by Google, you will gain strength in the highly competitive online business. Once your website is upgraded to HTTPS, you will attract the attention of a larger customer base. Both these scenarios will help you flourish in the online marketplace. After describing the pros and cons of the July 2018 deadline imposed by Google along with the implications this statute will have on your website, it is time for businesses put things into perspective. Instead of finding fault with Google for bringing this mandate, website owners should welcome this deadline as a positive move in the direction of website security. Had it not been for Google, visitors will bear the brunt of unsecure data transfers that take place through various HTTP websites. All in an attempt to take a step towards data protection and security, it is time all businesses comply with the July 2018 deadline of Google to reap all its benefits; in full.